Lincoln was the first President of the United States to be embalmed. His funeral and viewing was done with an open casket, so that in Washington, D.C., and at other stops along the route of the funeral train, citizens could view his body. the funeral train stopped in Cleveland, Ohio on April 28, two weeks after the assassination, where for the first time the casket and catafalque were displayed outdoors. Over 60,000 citizens were reported to have viewed the body during that single day. The next day the Cleveland Morning Leader newspaper reported on the funeral events, including this short article about the countenance of the face of the President. 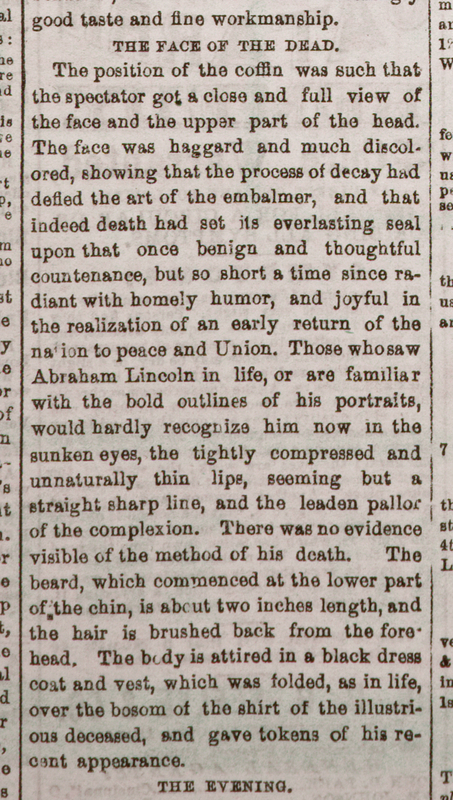 While there are many photographs of the catafalque on display in Cleveland's Public Square, no photographs of Lincoln's body were allowed, so that this direct report provides what we know of how he looked two weeks after his death. Permission for personal or research use; publication or reproduction requires written permission of the Western Reserve Historical Society.